After our Chinatown excursion and hitting the rambutan jackpot, we took our rental car and headed to Lanikai Beach, our slice of heaven. Lanikai is next to Kailua Beach and is about 30 minutes away from Waikiki via the Pali Highway. It's a paradise where the sand is super fine and the clear waters sparkle green and blue. Last year, we went on a weekday and pretty much had the entire beach to ourselves and we ran into sea turtles in the water. It was a little more crowded this year since we went on a Sunday but still, it was our paradise. But no sea turtles this year. We finally attack the rambutans. We also picked up some ripe papayas in Chinatown. They were so sweet and fragrant and only $0.49 cents a pound! I love tropical fruits. Yeah, we couldn't stay in Lanikai forever. Steph and I did a little damage to our credit cards at the Ala Moana Center the next day and came upon Goma Tei Ramen inside the mall. The place was really busy but the wait was quick. I got the Chashu Tan Tan Men. Oh my god, that was delicious. 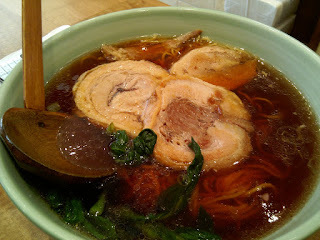 Three thick slices of tender fatty pork, steaming spicy tan tan soup and al dente egg noodles = ramen heaven! Steph got the regular Chashu Ramen which was just as good but without the spicy kick. I knew we could trust an island with a history of Japanese immigrants to have plenty of good ramen shops. 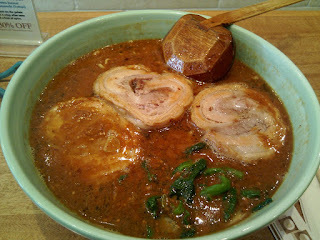 I would also recommend the oxtail ramen at Ramen Nakamura which I tried last year but didn't get to revisit this time. Roy's Restaurant is touristy but heck, the food is really good there. We went for a late dinner and they ran out of their signature Ahi Tuna entree and they only had enough for a poke appetizer (apparently, there was an ahi tuna shortage recently). I was very happy I got it. The tuna was fresh and the soy marinade was a perfect compliment to the fish; it just danced in my mouth. I didn't know Hawaii had breweries until my last night in Oahu. Luckily, I was able to try the Longboard Lager from the Kona Brewing Co. It was crisp with a very, very slight hint of hoppiness. I liked it. Giant Prawns and Seafood Medley with potato gnocchi. This dark, poorly taken picture (my bad) doesn't convey how good this dish was. Everyone in our party (of five) was very happy with our dinner. Chocolate Souffle. I've never seen Steph respond to a waiter so quick. She was going "yes, yes, yes" before the waiter could even finish saying "souffle." Smart woman she is. How can you go wrong with Chocolate Souffle? Okay, I was a little loco to order the Loco Moco but it's a unique Hawaiian dish and it was my last day in Oahu. This had 3 scoops of white rice topped with a thick hamburger patty, onion gravy and 3 sunny-side up eggs. The dish was overwhelmingly gigantic. I ate about one third of it and gave one third to Steph. My stomach begged me to give up on the rest. The loco moco wasn't out-of-this-world delicious but I'd recommend it if you have a hangover or you're like me and just crave a little rice with your breakfast. My Hawaii vacation was over in the blink of an eye because I was so relaxed and I was having so much fun hanging out with Steph and Andrew (even though Andrew is a card shark and an evil prankster preying on little ol' innocent me!). I really hope there'll be a reunion soon, either in LA, Hawaii or in Sydney. Ideally, it would be in Tahiti. Steph, you hear me?